The design for the Miawpukek First Nation K4-12 Grade school emerged from a reading of landscape and community. The school, located in Conne River Newfoundland, directly adjacent to the community's Powwow grounds, features 15 classrooms, a daycare, library/community resource center, gymnasium, music room, art room, fitness center, and a dental clinic. The building form takes cues from the directional pattern of its remote site—the linear classroom wings echo the ‘fingerprint’ left on the land by the glaciers. The primary axis of the building is oriented North/ South, allowing the main entrance to greet the southern sun. 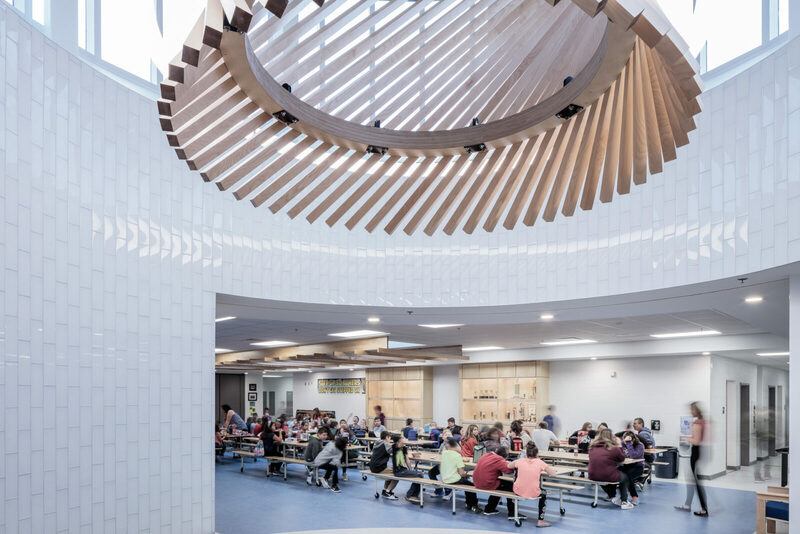 At the center of the school, a meeting place emerges as a circular room topped by a woven light drum and anchored by an eight-point star articulated in the floor tile. At night the building center, lit from within, glows as a lantern above the roofline, inviting the community to gather, teach and learn.